The San Dieguito Water District address is: District Secretary, San Dieguito Water District, 160 Calle Magdelena, Encinitas, CA 92024. (Indicate on the front of the envelope that the letter is for the August 21 hearing on proposed water rate increases). Why do you need this address? Your water rates and water meter charges are increasing beginning Sept. 1(next month) and a greater increase July l, 2014, if you do not protest these increases. Please do so in writing now, before the Aug. 21 water board meeting at Encinitas City Hall. WATER METER: If you have the smallest water meter size 5/8” or 3/4” your current charge is $33.53/every two months or $201.18/year. Effective July 1, 2014 you will be paying $36.39 per billing cycle or $218.34/year. That’s an increase of $17.16 per year. The cost increases according to the size water meter you have. Your water charges for a single Family Residence (SFR) and Multi-family Residential (MFR) are in tiers from 12 to 41+, and depends on how much water your household uses. There is no easy way to explain this, but I’ll try. For 20 Tiers or 20 Units of water every two months your charge is currently $2.26/unit for the first 12 Tiers or units = $27.12; and 8 units at $3.37 = $26.96 or $324.48/year. By July 1, 2014, you will be paying $2.73 or $32.76 for the first 12 units and $4.08 for next 8 units or $32.64 or $392.40/year. That is an increase of $68.00/year. 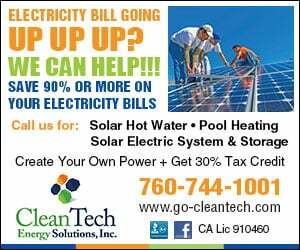 Together with your Meter Rate, you have an increase of $85.00 annually. Take a look at your water bill — see how much water your household is using. Every cycle will fluctuate. You may see all levels of water rates and be surprised to find how much water you are using at each level and wonder how they came up with those amounts. Especially within the higher levels. Be sure to ask. Oh, yes, in addition, everyone also pays a “pass through” charge for the San Diego County Water Authority (SDCWA) Infrastructure Access Charge (IAC) per water meter starting every Jan. 1 — currently at $5.30/billing cycle = $32.00/year. And, if you have “sprinklers” in your home, you also pay a Fire Meter Charge of $7.05 x 6 = $42.30/year. That amount as of July 1, 2014 increases to $7.65/mo or $45.90/year. DROUGHT RATES: If the state of California declares that we are in a drought and requests all of us to use less water…guess what? Our water rates go higher (for using less water)! Example: Your rate/unit of water as of Sept. 1, 2013 will be at $2.52/unit. If you reduce your water use by 20 percent your water rate is $3.03/unit. For a 50 percent cut back, it will cost you $5.06/unit! Go figure!! Agricultural, commercial, construction, landscaping and other categories do not escape water and meter increases either. Check out your numbers as well. It is not my objective in this forum to bury you with numbers. It is my objective for you to find the notice you received in the mail about a month ago, entitled: “San Dieguito Water District, Proposition 218; Notice of Public Hearing on Proposed Water Rates and Charges” and ask that you protest this increase, this fee, which by any other name is a tax. I will end this commentary the way that I started it. Write the San Dieguito Water District. If you can’t find your notice — go to the SDWD and ask for a copy. Unless you want to pay increased water rates — write a letter of protest to the address above and include your street or business address and parcel number (see your water bill). Write and mail or hand-carry your protest before Aug.21! Do not email your protest, it must be hand written and mailed or delivered in person. If a majority of ratepayers do not do this — we will all be paying higher water and meter rates. So please act now and tell your neighbors. Sheila S. Cameron is a former mayor of Encinitas.